Deaf dog: Jake is a 2 year old Border Collie. He is a wonderful dog and has had some training in agility. 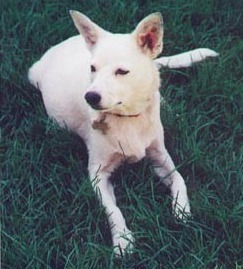 Other pets: Bo, a White German Shepherd, Buddy a Beagle, and a cat named Rat. 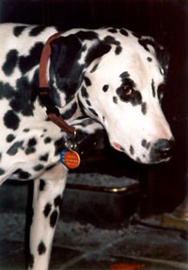 Deaf dogs: Isaac is a 5 year old male Dalmatian - excelling in obedience, agility and trick performances, and best buddy - star of upcoming video about training and living with deaf dogs, featured in television shows and magazine articles. Demo dog for my obedience classes and seminars. CGC. Cuddler extraordinaire. Nutmeg is a 6 or 7 year old female Dalmatian - had a very rough start in life but is now a wonderful and loving companion. Has been on a television show about deaf dogs. Queen of comfort seeking and smooching humans after being terrified of them. Zephyr is a 2 year old Whippet from wonderful breeder Karen Lee in North Carolina - surrendered by his first owners for killing chickens, now a wonderful companion and couch potato, best friend of Fidget, a hearing Dalmatian, and popular friend at the dog park. Learning agility, obedience and lure coursing. Other pets: 3 dogs, cats, goats, birds, and a chinchilla. Deaf dog: Ellie is an Australian Shepherd who was born deaf. I rescued her from a shelter with the intention of fostering her and finding a great home for her. As it turns out, I just couldn't give her up and so she made her home with me. 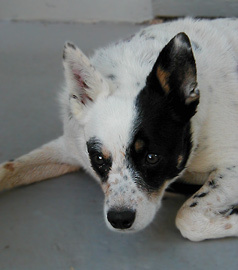 Scout is a 2-year old Australian Cattle Dog who, along with his littermates, Abby & Briar, were all born deaf. I rescued the three siblings from the shelter, found wonderful homes for Abby & Briar, and decided that Scout would be staying. Other pets: Ellie and Scout live with a hearing Border Collie, Kyle, a hearing Sheltie/ACD mix, Sophie, and four cats. Deaf dog: Clancey is a four-year-old Old English Sheepdog who was adopted from a shelter when he was 6 months old. People lined up to adopt him, but when the shelter confirmed that Clancey was deaf, they backed out. 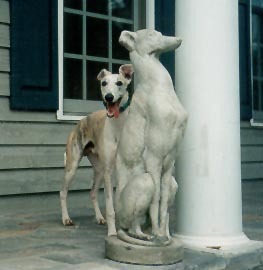 Their loss — Clancey has proved to be very smart and a real love. 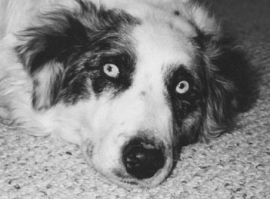 Deaf dog: Emma is a five year old Australian Shepherd. She is the most wonderful dog in the world. She was also born almost entirely blind. Most people notice her happy, joyful, well-adjusted nature before her they realize she is blind and deaf! Deaf dog: Shania is a 1 year old Chow and Chihuahua Mix. Her family says "My dog likes to play with people and she is one sweet dog. She understands what Hearing people say to her or when someone's trying to tell her something she understands. She runs around our neighborhood because she enjoys it . She likes to make new friends with people. She is trained well and I sign with her she tells me what she wants by dragging me by my shirt or she tells me if something is wrong. I love my DOG she is a good dog." Deaf dog: Skylar is a 1 1/2 year old Australian Shepherd. Her mom says "I adopted Skylar who was given up to a veterinarian and advised to euthanize her because she is deaf. Lickily for Skylar and me the vet refused and now I have the most wonderful dog who is very loving and extremely well mannered." Deaf dog: Frankie is a 3 month old Catahoula/Blue Heeler. His mom writes: "We have only had our Frankie for 3 weeks, so we are all still trying to learn how to communicate with him. He is my constant shadow, day and night. I think since the day we brought him home, he has not left my side. He loves to run right by your side and stays right by your heels all the time. He loves to steal my shoes and socks and tries to hide them from me. He loves to be held and likes to make eye contact. He is very intelligent and is almost housebroken. He likes to go for walks, and thinks he needs to also hold the leash in his mouth when we go out." Human companions: Quin and Debbie Morrison and children Christina, Cathrine, Chelsea, and Craig. Other pets: Ruby, a black Lab and 4 cats, Rascal, Java, Mojo, and Trickster. Deaf dog: Dante is a year old English Setter. "This little guy is the new love of our lives. He was born deaf but can hear a little bit every once in a while. He is very very smart and once we found out he couldn't hear I changed the way I was trying to train him and he caught on very quickly. He is lucky in that he has an older(and very patient) big brother dog who shows him what to do and puts up with Dante not hearing the normal growls. He is a great bird dog, even though he prefers to hunt isects that he can catch. One of the reasons that we picked him out was because of how lovey he was, he still tries so very hard to please us. Luckily I have always trained my dogs with silent (hand) commands for field work so he knows what all my signals are and now I need to learn more to teach him. We are now thinking of helping more special needs animals because of the positive experience we have had with him." Human companions: Ryan Gerwing and his wife. 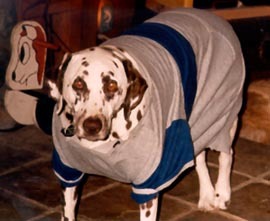 Other pets: An older English Setter named Suleiman and three kitty sisters all older, Phoebe, Aspen and Fadwa. Deaf dog: Angel is a 5 month old mixed breed. 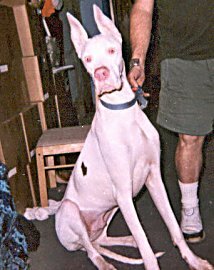 "Angel has the head and body of a Dane or Boxer and the coloring of a Dalmatian. 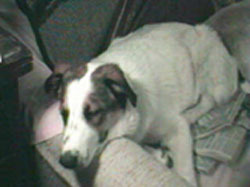 We just got Angel about a week ago, and it was not known at first she was deaf. I'm not sure if her breeders were even aware. I've never seen a deaf animal before but it was apparent from the beginning that something was wrong. She does not respond to any noises. I was at a loss as to how to train her until I got on the net. Now I know this is not so bizarre. She so far seems like a pretty good dog. She has been great and shows a lot of tolerance towards rough behavior. My son wanted to name her Angel because he says she's a gift from GOD and after today I agree." Human companions: Christina Noland, husband CJ, sons Jordan 6 1/2, and Colin 8 mos.